Just found this great graph in WHO's 2004 World Report on Traffic Injury Prevention (yes, I know, get a life). 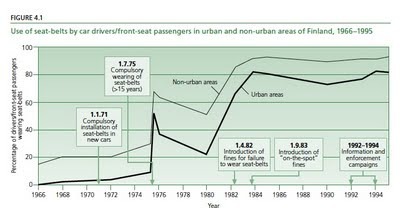 It shows how high profile law enforcement has made a big difference to buckling up behaviour, for 80% of Fins at least. Of course that's still 20% of Fins NOT buckling up..a lot of people. Incidentally eleven US states now exceed 90% compliance. In New Hampshire, the only US state without mandatory seat belt laws (true to its motto "live free or die"), the rate is 63.5%. In Australia it's 90% - 97% for those well-behaved Victorians.